Crunchy dog snacks made from 50% high-quality game meat, 48% potato flakes. Crunchy horse jerky nuggets with 98% high-quality meat. Crunchy goat jerky nuggets with 98% high-quality meat. Crunchy dog treats with 98% kangaroo meat. Crunchy turkey discs with 97% high-quality meat. Even when it comes to rewarding and training your dog it is important to be vigilant when shopping for dog treats. Just as with dog food, it is important to ensure that any dog treats you buy are made using high-quality ingredients and do not contain potential allergenic ingredients. 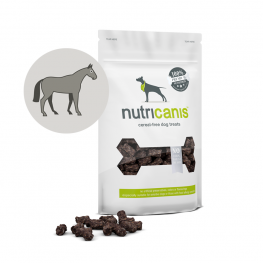 What are the ingredients in Nutricanis dog snacks? 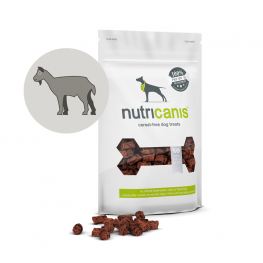 Our Nutricanis treats for dogs are made from gently air-dried meat. When making our snacks, we use single-variety meats, i.e. one source of animal protein (single protein) in each dog treat (except in the Buffalo Udder + Carrots variety, which contains buffalo as well as beef). This is an important point, especially for sensitive dogs and dogs with allergies. Our dog treats contain no grain or gluten, no sugar, no cheap fillers, and no artificial additives. 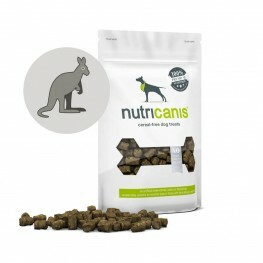 They are therefore suitable for sensitive dogs and dogs with allergies. 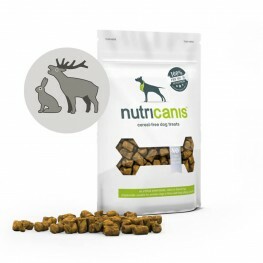 Nutricanis dog snacks are produced in Germany. 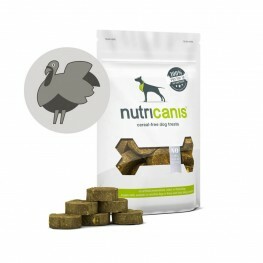 Our dog snacks are available in different flavours including turkey, duck, salmon, game, kangaroo, and buffalo. We also offer special value variety packs including a practical storage box to keep the dog snacks fresh and tasty for longer. Nutricanis dog snacks are a healthy, low-calorie reward for your dog during training, play, or simply because you want to treat him.